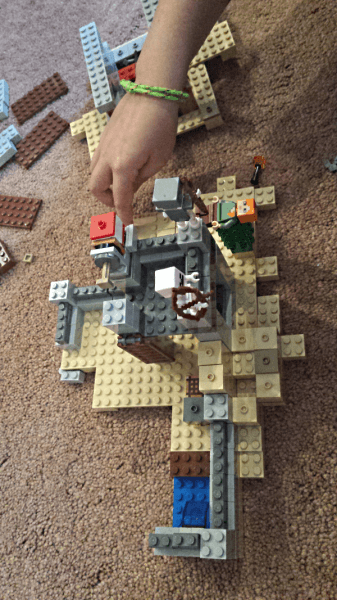 If your kids can’t get enough Minecraft, they’ll have a ball putting together a LEGO Minecraft The Desert Outpost (21121) kit. With 519 pieces, the set offers several hours of creative family fun in constructing the outpost. Kids will enjoy playing with the finished product, and when it’s not functioning as a toy, it looks great displayed on a shelf. You can find the LEGO Minecraft Desert Outpost kit for about $59.99 at major retailers. It includes a huge variety of nonstandard and typical LEGO blocks and a number of cool accessories and mini-figures. The recommended age range is 8 and up, but my 8-year-old niece, no stranger to LEGO kits, became very frustrated less than halfway through and required some grown-up help. She did end up doing most of the work, but the set is a little complex for young kids to complete on their own. 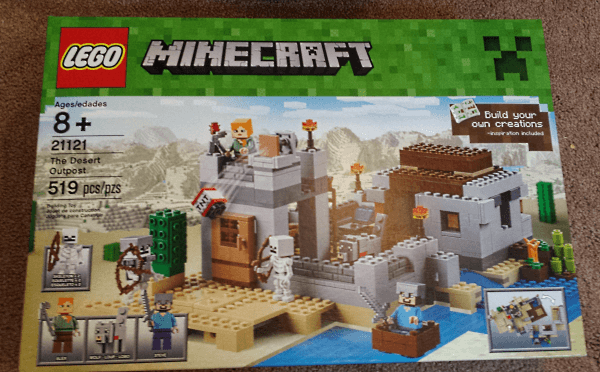 Unlike some LEGO sets such as 21102, the Minecraft Desert Outpost comes with one instruction book, rather than a separate book for each bag of parts. Multiple builders working together need to work with the same parts bag and manual. Construction needs to take place on a hard surface such as a floor, table or desk. Parts of the build can pop apart on carpet, particularly when two blocks are held together by one block. The completed desert outpost features a fortress, lookout tower, TNT launcher and protective wall with torches. Accessories include a bed, table, door, boat and ladder, plus mini-figures Alex and Steve with their assorted tools and weapons. There’s also a wolf and two skeletons along with torches, sword, skeleton bows, sugar cane and wheat. The finished Desert Outpost measures 10 inches wide, 13 inches long and 4 inches high and can combine with other Minecraft LEGO kits if desired. It makes a wonderful display item or enjoyable toy. 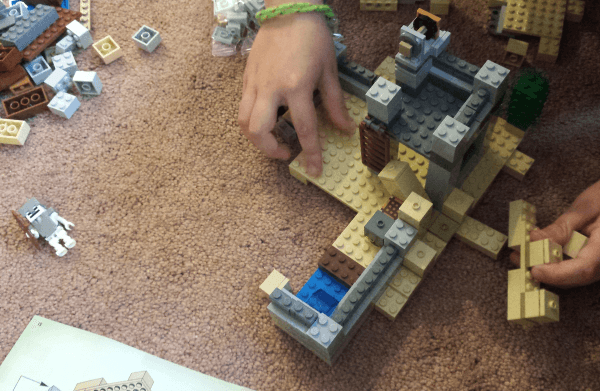 Many kids, particularly younger ones, especially love playing with the LEGO Minecraft accessories and mini-figures. 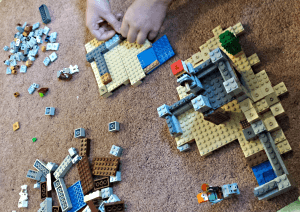 LEGO sets such as the Minecraft Desert Outpost make fantastic rainy day activities for loads of indoor fun. Read more of my Minecraft posts here and more of my LEGO posts at this link. 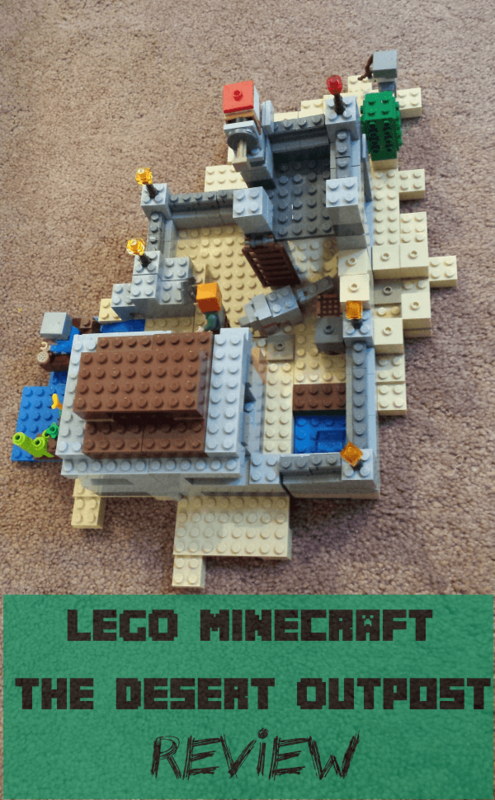 I received a sample LEGO Minecraft Desert Outpost kit for evaluation purposes. 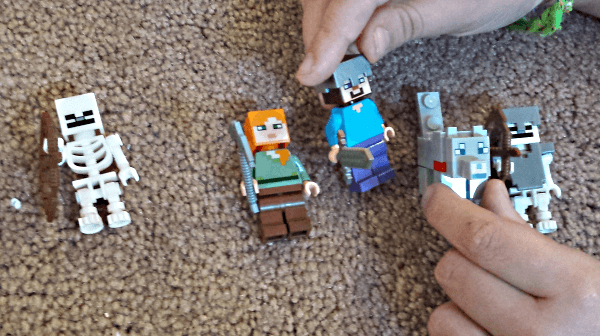 Do your kids love Minecraft? Have they ever put together a LEGO Minecraft kit? What did they think of it?